How do I choose a Guardian for myself? I really enjoy helping people with estate planning questions. 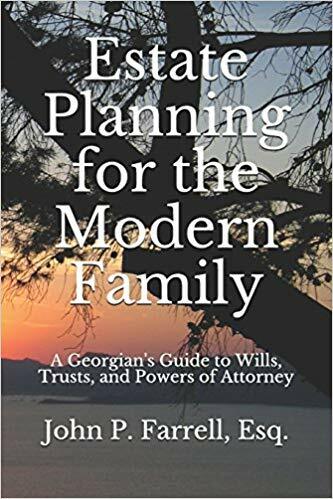 It’s one of the reasons I wrote my book, Estate Planning for the Modern Family: A Georgian’s Guide to Wills, Trusts, and Powers of Attorney. But, every day we make hundreds of decisions from what to eat for breakfast to where we go on vacation. With each passing day, there are more choices to be made. But, what will happen if you can’t make decisions for yourself? Before that time comes, there is one important decision you need to make. Who do you want to serve as your guardian? For those of you who have had your estate planning recently done or reviewed, you probably discussed and executed a Financial Power of Attorney. For those of you on the fence about having your estate planning completed, this is another valuable reason why it is so crucial. With this document, you are authorizing someone to handle your financial affairs (sign checks in your name, open up a bank account, enter into contracts on your behalf, etc.). This can be very beneficial because if you are no longer able to do these things for yourself, someone else can immediately step in and do them for you. However, you may run into situations in which third parties are going to want the person to have more authority than just a signed Financial Power of Attorney. In these cases, they are going to require you have a Guardian appointed. A Guardian is essentially a court-appointed and court-“controlled” agent. They have the court’s authority to handle your financial affairs on your behalf if you cannot. In many jurisdictions, the court will give priority to an individual who has been named as agent under a Financial Power of Attorney, making it incredibly important that you have one prepared. If you do not have one, each state will have a law that lists the order in which people are appointed. In some cases, you could end up having someone handling your affairs that you would have never wanted, like an estranged parent or sibling. A financial power of attorney lets you share your wishes with the court. Does he or she have the time to act as your guardian? Often times, those individuals who are the most organized and knowledgeable to help out are also the most heavily scheduled individuals and may not be able to step in. Does he or she live close by? Even in our digital world, some issues may take multiple steps or in-person interactions to resolve. If the individual you are looking to appoint lives far away, he or she may not be able to fully carry out their duties. Does he or she have the skill set needed? When acting as a Guardian, it is crucial that the individual is organized, thorough, and can communicate clearly. A person who is scattered or flies off the handle easily is not going to be a good advocate for you. While we all want to retain as much autonomy as possible, there may come a time when we need someone to act for us. Selecting the right individual will ensure that you are taken care according to your wishes. If you have any questions or would like to discuss who you should appoint for this role, contact us at (678) 809-4922. We’re here to help. Previous Previous post: What does an Executor do? Next Next post: Who do I choose for an Executor or Trustee?